Big change in Japan? Not NIRP. And it’s rippling to other countries. You are at:Home»Asia»Big change in Japan? Not NIRP. And it’s rippling to other countries. Confusion results when “deflation” as a word is used loosely. What matters is the cause of price changes. Is it “deflation” in the strict sense — money and central bank rates? Falling amounts purchased? Rising taxes cutting purchases? Falling costs of production? Excess liquidity searching globally for yield? Smarter shoppers searching for lower prices? Other? “Deflationary mindset” is not bad when consumers are buying more – it’s good. Over the past 20 years, purchases have been growing with falling prices. Two big exceptions are the 2008 crash, and introduction of QE and consumption tax (the “fishhook”). Saying “deflation is problematic because of implications for demand” has not been true for over 20 years. This is pictured when the price-quantity time-track turned downward-sloping. For decades, PIPE Factors (especially pacts for trade and exponential technology) have decreased price levels, and increased production and purchases. Japan Inc.’s explosion of better products and lower costs (especially consumer durables) meant lower prices and purchase growth. Two decades of “much more for less” leads to what is negatively termed “deflationary mindset.” Again, the flip to a downward-sloping price-quantity time-track. Not unique to Japan — more advanced in Japan. Happened in all industrial countries to varying degrees, next closest is U.S. as seen in this data animation http://feddashboard.com/no-fear-of-deflation-if-cause-is-pipe-factors. See also Europe section of Fed Dashboard & Fundamentals. 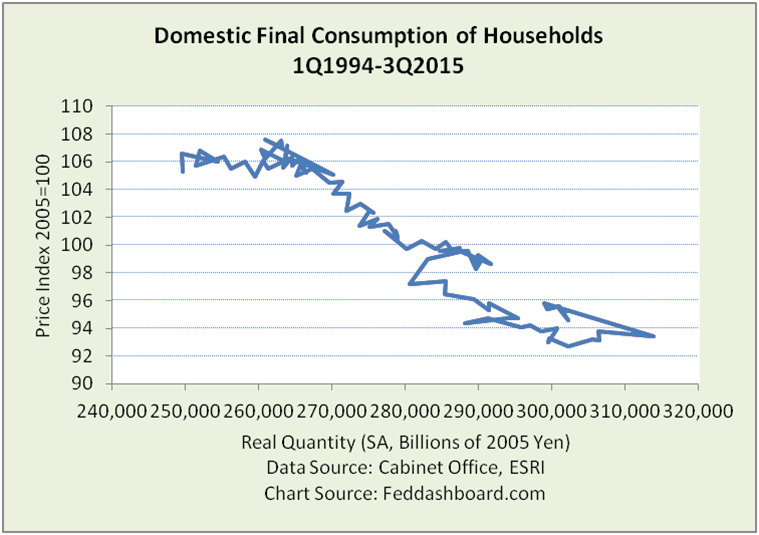 Natural interest rates have probably fallen in Japan – not because of low demand. Rather, mostly because of lower costs of production (that’s good) and cash piles (including cash stashed by Japanese in dresser drawers and overseas banks). This is the “cash gearbox” effect. CAUTION: BoJ’s attempt to fight technology both: hurts consumer purchases (as seen in the “fishhook”) and efforts of other ministries to regain “Japan Inc.” strength.